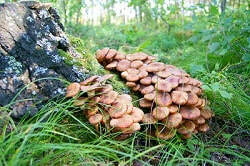 Honey fungus is a disease dreaded by gardeners. It can attack and kill most species of trees and shrubs, both herbaceous perennials and woody plants. These fungi grow under the bark of the tree, normally low down near the ground. They kill the plant’s roots and toadstools or mushrooms may appear in late summer. Like many fungi, these spread underground and feed off decaying as well as living plant material. They produce structures called rhizomorphs which are like roots growing close to the ground. They can spread at a rate of a metre each year, producing huge organisms covering large areas. Honey fungus produces symptoms including dying roots, dieback and even the sudden death of trees and other plants. Since no recommended chemical control exists for honey fungus, the only known treatment is to remove and burn infected plants, ensuring the roots are dug up and disposed of too. This is the only way to avoid contamination of other plants in your garden. Strangely honey fungus mushrooms are eaten in Europe and are considered superior tasting wild mushrooms. However, they must be properly cooked to remove toxins and since some varieties can interact with alcohol it’s advisable not to consume them within 24 hours of drinking! Call us or fill in the form for help with your trees.